Monitoring application for checking your mining on ethfans.org Ethereum Pool. Application EthFans Mining Pool Monitor is designed for Android devices and it provides features, which you find below. Take a look on your mining workers and check your mining statistics on your favorite pool. Check actual payments balance, your earnings and other information about your mining. Watch success of your miners, check hashrate, rounds chart and many other information. We are providing email support for this application. If you have any problem, please, write us! Are you journalist or Blogger? Feel free to contact us with questions about application EthFans Mining Pool Monitor. It will be pleased if you mention about application on your blog or magazine. Just ask for free voucher with additional or premium functions. We very much appreciate your support. Write about application, thanks a lot! Simple application for monitoring your Ethereum mining on pool.ethfans.org mining pool. 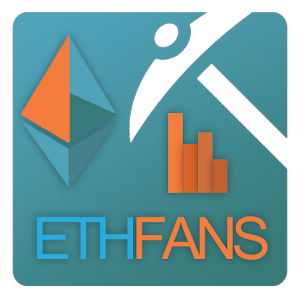 Application EthFans Mining Pool Monitor was reviewed by people and they satisfation score is /5. If you like this application, please rate it too! Here are some screenshot preview images of EthFans Mining Pool Monitor. Let's see how application looks. Just try it and tell us what we should do better. Application EthFans Mining Pool Monitor was downloaded by people Just download and try it also. Simply write your experience with this application.